You don’t have to learn a martial art to pick up tips from them on how to solve disagreements…just know some principles and apply them. You don’t need to be coordinated or fit. The discipline and calm will follow as you learn the key principles. Like any martial art, there are some conflict management moves which will work in many conflict situations. With both conflict management skills and martial arts, the effectiveness grows the more you practice. The right mindset is absolutely key for both. 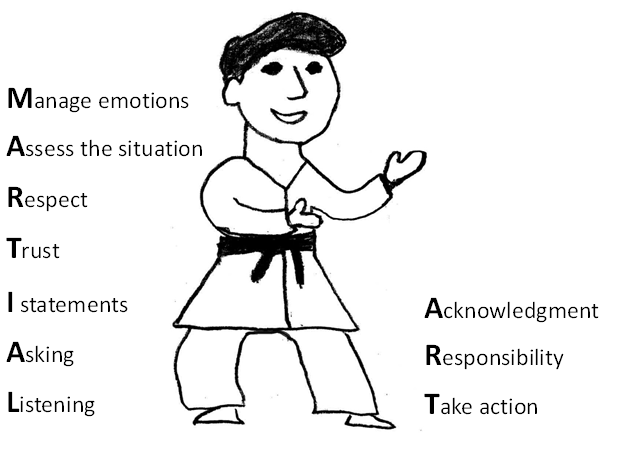 The image of the martial arts master t is provided to help you remember these key principles. Evolution has hardwired the flight/fight/freeze response into us all. This response is triggered when there is a threat or a change and has protected us by giving us the extra boost of adrenaline we need to fight or run away or freeze. It’s a great help if we are faced with a cliff to scale, something to run away from or someone to fight. It’s a big disadvantage if the threat or change needs us to be able to think. Because as well as switching on the adrenaline and power to our muscles, it switches off our brains. So just when we really, really need to get it right, our logic disappears. If we don’t control this response, we are left with anger, fear or numbness. These emotions aren’t helpful when we need to solve disagreements. Our anger will make others feel threatened and they, too, will be under the control of the flight/fight/freeze response. When we are in the grip of this survival instinct, all we see is danger, we interpret others’ actions as threats and focus solely on what is best for us. We need to calm and control this response. Taking the time to do this is essential, as otherwise, we will reduce our chance of managing the conflict successfully. The first thing to do is to breathe slowly and deeply. This slows and steadies your heart rate, and gives you time to assess whether your instinctive physical reaction to the event is the most appropriate. More information on taking back control. Download my ebook with tips about staying calm. Certain things will anger me depending on the situation or the person who does it. What’s the difference? It’s the story I tell myself about his action that makes me mad. I may tell myself that he keeps me in the dark because he doesn’t trust me to keep a secret. Or I think that it is because he wants to hurt me. It is these stories and assumptions that make me mad. If another person was involved, I may tell myself that she forgot, that it wasn’t important or she didn’t want to trouble me. So, you need to assess the situation and look at the information you have and the stories you are telling yourself. Feeling that people don’t respect us causes conflict. We can’t solve disagreements without restoring respect. Once you have your emotions under control, it will be easier to show respect. No matter how bad the behaviour, try and separate it from the individual. Try and think of something that you respect about that person. If you don’t know the person, think about how you or someone you love would want to be treated in a similar situation. Courtesy and kindness not only makes the other person feel better, but will also make you feel better. In a crisis, there are four things that will maintain, build or restore trust. More on trust here. Speak the truth. Be as honest and as clear as you can. Do what you say you will do. Don’t make promises you can’t keep. Be consistent. Be kind. Admit your failings. Help people to feel safe. Think of others’ needs and feelings. An I statement is one that focuses on what I see and feel rather than why I think you did what you did, and is usually better received by the other person. The tangible and concrete effect that behaviour has on me. Asking someone for their view helps diffuse many conflict situations (See Chapter 7 for more details on questioning). Be genuine in asking and avoid the use of why. Tone and body language are particularly important if tempers are frayed and the stakes are high. 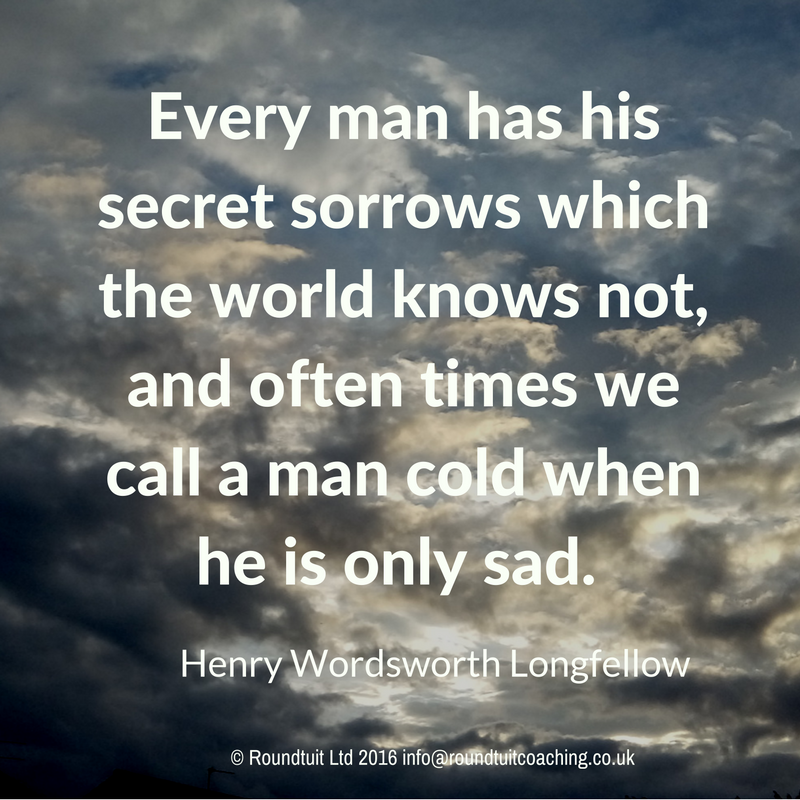 Acknowledge the problem, and their pain as well as yours. Notice the things you agree on as well as the points you differ. Instead of confrontation, try accepting their right to have a different view, build on things you have in common and compare your view with theirs. Try and see if there is a way that both your needs can be acknowledged. It can be scary to admit fault, but generally, it will help rather than harm the situation. All negative situations that occur are a combination of three factors: our own actions, the actions of others and random unpredictable factors. We are each responsible for our own behaviour and taking the feelings of others into consideration, but in the end, everyone chooses how they feel about a situation. In every problem, it is helpful to look for what you can control and be responsible for. Some people take too much responsibility and beat themselves up. Others take none, blaming the weather, other people or bad luck. Be realistic and honest about what is your responsibility. You’ve calmed things down, you’ve sorted out what the problem is and agreed on a way forward… don’t stop. You need to follow through and show that you meant what you said. It is always worth ending a conversation with a summary to make sure everyone is clear. Even if you don’t agree on everything, agreeing to disagree and planning the next steps that need to be taken should be followed up. Don’t leave things hanging. If you need help to solve disagreements, I’d love to know what topics would be most helpful. Please email me with any questions on help@nancyradford.com.